This is an excellent piece of analysis. I like it a lot, and will point students at it. Thanks Tony! :) It was inspired by the DVD for A330! VERY interesting take on this! It's not one of the episodes I usually remember when I think of the series. 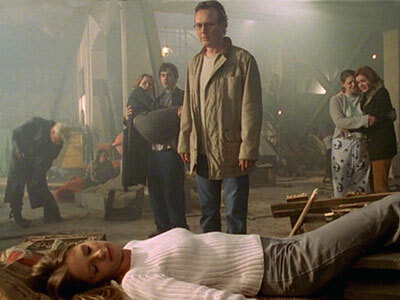 I'm astonished I had forgotten the key final scene when Buffy walks into her house... I always just think of "The Body"! "it is also significant that, unbeknownst to Buffy, at the exact moment she sits and comforts the dying April, her own mother is dying, alone, in their house. April's death quite literally marks the end of Buffy's childhood - it is a death of innocence and of childhood comforts like 'when life gives you lemons, make lemonade.'" Very true... an idea that hadn't dawned on me. As for Pygmalion, whenever I did think about this ep, I always considered it to be an anti-Pygmalion story: man creates perfect woman to love, only to discover that perfection isn't all it's cut out to be and prefers "real". Yeah, definitely - something distinctly lacking in the Pygmalion myth, which in Ovid's version ends all happy-ever-after! (and is, therefore, incredibly insulting to women).